That last autumn, it rained for ten days and nights, and then ten more. After reaching the notorious halfway mark established by the greatest flood in history, as routine deliveries stopped and communication with the world beyond the dense green veldt surrounding the ancient manor was severed, it soon became clear to the residents of the Arkham Orphanage for Lost Young Souls that they were trapped, on their own. Life as life had been was ending. Maybe, the world was already gone, only the Sisters of Mercy and their charges, in their remote imprisonment, were the last to know. Rain hammered the woods and soaked the earth. And the things that lurked deep beneath the waterlogged ground awakened and began to tunnel up. Princess Darby Dawson slowly approached the forbidden room. The door, an ugly slab painted long ago in industrial green, hung half open, showing snapshots of the miserable former life those on the other side of the threshold had once been condemned to endure: beds in metal frames, a length of window covered in bars on both the outside and in, scuffed floors coated in dust and a wedge of visible pattern etched into the wood. Clawed according to the gouges, thought Darby with a shudder, her first real proof that the situation was spiraling toward wrongness. “Go on, Princess,” one of the mean girls taunted. “If you dare,” said the other, standing close enough behind her that Darby felt the girl’s breath on her neck in warm, unpleasant whispers. “Sure,” promised Rona, the meaner of the two. Darby sensed it was a lie. A terrible second after breaking focus with the image scratched across the floor, a hard shove to her spine confirmed it. The room came rushing up, swallowing Darby whole. The door slammed shut behind her. The click of a lock turned in counterpoint to the echo. Darby immediately tested the rusted knob but the door refused to budge. “Let me out,” Darby demanded. Giggles filtered through the door. “We don’t take orders from you,” said Rona. “Have fun.” This came from Kirsten. Their taunts abruptly ended, leaving Darby in the one room above all other places in the sprawling gray manor the children had been ordered to avoid, its strangulating silence broken only by the continuous elegiac drumming of the rain. Darby called out and pounded on the door, which only mocked her. After all, it had denied escape to countless others—adults, if Rona’s discovery earlier in the summer, before the storm, was to be believed. With her heart attempting to throw itself into her throat, Darby turned toward the barred windows, which peered over the dense, unhappy woods at the orphanage’s rear grounds. In a clearing far beyond the timber line, the leader of the mean girls, running away for whatever imaginary life waited on the other side of the river, claimed to have found a circle of scorched earth. Among the remains of burned objects—ledger books and glass medicine bottles—were a key ring and keys, and a metal sign. The sign’s paint was gone, but an afterimage burned into the metal spelled out the missing words. Arkham Sanitarium for the Criminally Confused. Darby tried the lock again. The door offered no give. It hadn’t been blocked with a chair, oh no. Darby’s mind raced back to the clearing. Rona, who always dreamed of escape, had locked it using those relics of the manor’s dark past. The keys. Darby’s eyes wandered across the dusty floor. The pattern scrawled into the wood smothered her anger with an icy note of panic. Her gaze fell into the whirls and symbols, wandered the concentric circles. The oatmeal sitting thick in her stomach from breakfast reappeared on a foul hiccup. Darby’s gorge threatened. Her bladder cramped. A shiver tumbled down her spine. The world wasn’t insane enough already, it needed to grow even darker, deadlier. She willed her eyes to blink. Breaking focus took the greatest effort. Darby hurried over to the window, thick tears clotting in her eyes. Somehow, she choked the vomit back down. The weight of the plastic case hanging from a strap of pink beads on one shoulder helped bring her out of the spell. She pulled the lunchbox-turned-shoulder bag against her heart. The wind smacked a branch against the window. Darby shrieked, scurried between two of the nearest beds, and shook as the clouds opened up and rain drilled against the manor’s exterior with fresh rage. The afternoon arrived, clocked by the only method available: the deepening gray glow from beyond the barred windows. The very real possibility that day would surrender to night with Darby still trapped inside the ward sank in. Thus far, the Sisters of Mercy hadn’t noticed she was missing, any more than they’d shown much in the way of actual compassion since her arrival to Arkham the previous spring or through the worsening situation in autumn, when rivers rose and valleys transformed into great lakes around their hilltop prison. A full night in the room where the crazy people, the murderers, once lived. The notion threatened to paralyze her. Darby opened the lunchbox. Inside was a banana swiped at breakfast, its skin tattooed in an uneven leopard print of brown blemishes, a few pieces of hard candy, a juice box. The barest of rations, but she wouldn’t starve. Not that she had much of an appetite. She reached behind the meager meal, fumbled aside the hardcover book swiped from the library—a melodramatic novel set in England—for the piece of antique silk wrapped around her late mother’s rosary. Darby rolled the mother-of-pearl beads between her fingers and prayed not only to the Virgin Mary but whoever else up there might be listening. The bars on the inside of the window and those outside conspired to keep the prayer from leaving the room, she mused, defeated and worried that her pleas had instead fallen into the swirls dug into the floor by desperate fingernails. Her eyes drifted back to the arcane hieroglyph. She drew in a deep breath, smelled something spoiled beyond the stagnancy already lying thick over the room. She was stuck. She’d have to wait out her imprisonment, hope for mercy from either Rona and her friends or discovery by the merciless Sisters. Until then, the odd pulses rippling out of that floor design and over her skin needed to be contained. Darby stood and tugged at the closest of the old mattresses. Working it free from the bed frame took all of her strength. By the time she’d gotten the fourth free and stacked atop a growing pile over the floor pattern, she wished she could control her sweat glands. The Sisters of Mercy weren’t very big on doling out kindnesses, and the mean kids had labeled her a princess as the world was ending and the dark water surged ever closer to the gates of Arkham Orphanage. A princess forced to do hard labor, Darby thought with a humorless chuckle. Still, as the first of dusk’s fingers wandered in through the windows, she allowed herself a degree of pride. Six of the room’s eight mattresses, one hefted haphazard over another, had nearly hidden the sinister diagram. A seventh would complete the job, leaving an eighth for sleep should fate not intervene with freedom from this terrible place. She made a game of it, all the work stoking her hunger. She’d eat her treats, and they would be the most delicious in the history of any meal savored by King Henry the XIII or the President or a Hollywood movie star. And when she finally got liberated, not only would that miserable little witch Rona catch Hell-and-brimstone from the Merciless Sisters for the rotten deed she’d done, but Darby would return from the abandoned wing with a story to tell. She moved to the seventh bed and flipped the mattress, only to recoil instantly at the rush of sights and smells. Several fat gray beetles scurried out of their hiding place. As the moldering odor assailed Darby’s nose, her eyes zeroed onto the stain dried across the underside, reddish-brown. And then she backed into a spider’s web connected from the cornice to the bed; a great ugly and inelegant web, spit out of its weaver without care unlike the intricate uniform gossamer she often saw in the wild green places around the grounds before the storm flattened everything. Darby imagined spiders in her hair, on her clothes. Eight-legged horrors with gemstone abdomens filled with poison, clacking down the walls and over her skin. “I can,” a voice whispered from somewhere over her back. Darby spun around, but there was no one else in the room. At some point in the early night that felt like hours after darkness fell but was likely only minutes, the waterworks outside as well as inside the room stemmed. Darby dried her eyes on her sleeve to see the rain driven apart by the moon’s milky light, pouring through gaps in the thinning clouds. Was it possible that the storm would, at long last, take an interlude? She drank the juice box, sucked on one of the stale old lady candies swiped from a bowl on the librarian’s desk, and began to feel the slightest degree better. Moonlight was a gift, second in value only to sunlight. She would get out of the room. Tomorrow promised a fresh start, an escape from this terrible place, perhaps a sliver of mercy from the Sisters in response to all she’d suffered. At least the beetles weren’t bed bugs, which had infested other parts of the orphanage. Lemons into lemonade—even the horrific rain was letting up! Exhaustion overwhelmed her. Darby cast a glance at beds seven and eight. There was no way. Reluctantly, she climbed atop the stacks of mattresses and drew into a fetal curl atop the one at the corner farthest from the center. Her eyelids grew heavy. The mattresses shook. Darby’s eyes shot open. Fear teased her flesh in slithering, icy tickles. You only imagined it, like spiders in your hair, her inner voice tried to tell her. Darby held her breath, aware of her galloping pulse, now magnified through her ear, pressed against the dirty old mattress. The mattress shook again. Darby screamed and slipped off, onto the floor. There was something moving underneath that pile. Darby Dawson arrived at Arkham in the spring. The orphanage—once a home for crazy and dangerous souls, according to the mean girl who’d taken to taunting her when not trying to escape to the world beyond the woods and rivers—existed at what seemed the end of creation, far from hope and comfort. By summer, Darby suspected that the wrongness in this blighted place owed to more than Rona’s tales about scorched circles deep in the woods or rumors of twisted trees, strange piles of rocks stacked in vulgar human shapes, or pictograms on the walls of the cellar, which glowed with unnatural colors in the dark. Now, in an autumn of constant rain, Darby had tangible proof that she was entombed within the walls of the realest of haunted houses. The mattresses shook. Vibrations rippled through the springs and strings, the dust and dust mites feasting upon long-dead skin cells. An oaken groan issued up from the floor, from that pattern clawed into the wood. Darby braced her back against the metal footboard of the nearest bed. A sickly light the color of old bruises oozed from gaps in the pile. Invisible hands forced the mattresses apart, revealing the unholy hieroglyph beneath. The sallow light pulsed. Waves of physical energy rippled up from the whirls and gouges. Darby screamed, but the dark emanations smothered her voice. Her eyes, wide and unblinking, locked on the pattern. Something moved within the glow, ebon-skinned, a million miles away, a billion. Though robbed of her voice, Darby heard its buzz quite clearly, a terrible ripple through the air, the sound of flies and bees —only many times worse. It slithered over her skin, conjuring goosebumps. A billion miles distant, but quickly moving closer. Closer. A billion or more bodies, slithering in formation, marched down into that dark, damp vortex, waiting for the order to ascend from the there into the here. Darby’s eyes burned. She remembered to blink, several times in rapid succession, and the nearest obscenity crawling out of the vortex scurried almost to within reach between the shutter-clicks. The light in the hieroglyph dimmed, and the horror coming through foisted its way up, striped sections of its bloated abdomen glowing with the same sickly colors, as though it had absorbed the energy. No, some disconnected part of Darby’s mind corrected—it was the source of that noxious bruised power. A doorway had opened, but not the one to escape that Darby sought. “Lub-dub,” the monster buzzed, like a bee. A giant bee, bigger even than the adults that towered over her in the world outside the locked ward, bloated and filled with toxic yellow-green venom. And not simply any bee, thought Darby, but the queen. Once upon another time and place, in her life before Arkham Orphanage and the end of the world, wasps built a papery gray nest in the tree outside Darby’s bedroom window. What started as a muddy smear among the branches swelled, tumor-like. Sadly, Darby knew all about malignant growths. One blossomed within her mother’s pancreas and its tentacles lashed out, consuming cells and corrupting other organs. Before her death, which ultimately led to Darby’s sentence at Arkham Orphanage, the former sanitarium, her mother, drained of energy, her skin going gray like the wasp’s nest, hung out the wash on the last warm autumn Saturday, a day that existed one year and a million centuries in the past. The laundry drifted in a deceptively tranquil breeze, colored by a palette robbed of vibrancy, like artwork in some of the old books Darby read in the library as a method to escape from Arkham’s drudgeries. Most of Darby’s memories of that happy other time were going steadily threadbare, losing clarity in the face of uglier, more immediate concerns. But the one element that retained its miserable sharpness came about when she stuck her leg into her clean pajamas, which smelled sweetly of that lost afternoon, and exquisite pain raced up her thigh. Unknown to Darby until that moment, a wasp, likely a soldier from the tumescent nest growing in the tree outside her bedroom window, had crawled into her pajamas and, acting as wasps do, stung at her flesh repeatedly, unleashing ugly jolts, the emotions stained purple and yellow in her imagination, like old bruises. The horror from the evil symbol carved into the floor—a nest, Darby thought even as she clamped both hands over her mouth to silence her screams—extended its forward legs, slender black appendages capped with pincers, and pulled its mass out of the vortex’s dying light. The Queen tipped her head toward the cleft between the beds where Darby hid and the moon cast a silver spotlight, illuminating the monster fully. Its body was dark and hairless, with jagged spikes along its spine, its leathery wings unfolding like those of a bat. A sheen of dampness glowed on its exoskeleton, as though the act of exiting its nest through the portal and into the reality of the sealed ward at Arkham Orphanage had required it to brave the rising flood waters. The jaws of the Queen’s mouth clacked. The yellow venom in its sacs pulsed. Its head tracked her, but the Queen, Darby saw, had no eyes. She’d read it in a novel, but the significance didn’t register until Darby covered her ears to smother that alien voice, causing her to hear the rapid lub-dub of her pulse broadcast in echoes off her palms. No eyes. The Queen from a place so dark that eyes didn’t matter had locked onto her heartbeat. Darby tested the theory by shuffling out of hiding and around the bed, keeping as quiet as possible. The monstrosity’s head shifted, tracking her course. It scrambled forward and made a lunge for her. Pincers clacked at Darby’s sneaker, slicing through the rubber sole. If the Queen seized hold of her body, Darby knew the pain would be so much greater than the worst of those stings still so vibrant and purple-yellow in her memory. No eyes, but the Queen knew her position in the room. She can hear your heartbeat, thought Darby. Darby shifted to the left; the Queen’s antennae twitched, a face without eyes darted in her direction. The slightest sense of pride dared flicker through the terror lying cold over Darby’s flesh. The Queen pushed toward her. A vulgar, wet sound slapped across the floor. Darby matched the advance in retreat, crab-walking backwards. Her mind raced. Her hands scrambled. Something cold sat in that last small wedge of real estate between death and the wall, hindering her escape. Darby scooped it from behind, grabbed hold of her mother’s rosary, and held the cruciform before her. The Queen rose. Seconds tolled with the weight of hours. Then the Queen’s mandibles parted, and the chilling cackle that issued forth stung at Darby’s ears. She was in the library, lost in her own headspace, where Darby often traveled, trying not to think about the rain, the end of the world, when the mean girls surrounded her. Imaginary ice jolted through Darby’s insides, paralyzing her to the spot. Her eyes studied the same words on the pages of the novel set in England but she could make no sense of them. At the periphery lurked Rona and her good pal Kirsten. “Want to see something?” Rona asked, a hint of malice in the question. “You’re always reading, you little freak,” said Kirsten. She wanted to tell them how books and reading had saved her life, offered a form of escape from worries, of which everyone’s were mounting, but held the notion within her head. Even as the wheels came off the planet, her enemies refused to relent. They were bored. Darby was the cure for their restlessness. The conversation continued in a disconnected fashion, with Darby’s lips moving and words emerging, though involuntarily, like breathing or blinking. “We’re not supposed to go there,” the hijacker said in Darby’s voice. Their promise was a lie, Darby figured. But she wanted it to be real enough that she gave in, scooping the old book off the table and into her lunchbox, along with the leftovers from breakfast and stolen candy from the librarian’s desk, relics from her old life mingling with cheap trinkets from the new in this terrible gray prison space. It could save her life! She reached into the lunchbox, gripped the book’s spine, and in one fluid motion whipped it at the Queen’s head, just above that place where eyes should have existed. Her aim was perfect; the book’s hardcover smashed into the Queen’s antennae where they joined her skull. The monster deflected, instead striking the bed frame to her left, spilling the mattress the rest of the way and crumpling the footboard. A loud metallic clank rang through the confines of the sealed ward. Darby jumped back to her feet and over to the windows, clutching the lunchbox to her chest. Joining the hollow clatter of metal was an alien groan born of a dark, unimaginable realm, though clear enough to decipher: Darby had struck a painful blow against her adversary. She grabbed the rosary beads. They might not work as a threat against the horror that had tunneled up through the floor, through layers of turgid liquid pooling someplace deep yet just beneath the everyday world, but they drew her back from the darkness threatening to engulf her. The bed lay in pieces, jagged metal from snapped rails jutting up through the mattress. Darby’s eyes lit on the sharp glint of reflected moonlight—a weapon! But what good was it to her, trapped as she was in this miserable place? The beads grew warm in her hand. “Where are you, my little one?” the Queen asked, a clear note of pain resonating with the words. A branch scraped outside the windows. Lightning-quick, the Queen threw herself at the pane, her powerful mass nearly crushing Darby in the scramble. Glass shattered but the bars on both sides held the spider webs upright. As the horror clawed and bit, focused only on sounds, Darby’s wide eyes settled on the poisonous yellow-green stripe pulsing beneath the Queen’s twitching stinger. Her eyes shot back to the impalement, one sharp, impromptu spear jutting up from the wreckage of the broken bed. Steeling herself, Darby pitched the rosary beads at the sealed door. A sort of melody sang forth. The Queen revolved, tracking the music, sprang. Wood shattered. The ward’s locked door blasted out of its frame. And Darby Dawson, labeled a princess by her enemies, showed that she was. A warrior-princess, she grabbed the length of metal and drove its point into the Queen’s venom sac. Darby thrust the spear deeper and prayed its smoking point held together long enough to pierce the inside of the Queen’s skull. “I’m not your dear child,” Darby huffed, and pushed with all her might. A cool, damp breeze drifted into the room through the shattered windows. The bars held—there was no escaping that way, only through the door that had imprisoned her, now opened again to the dark corridor. But the Queen’s carcass blocked her path. As Darby watched, the body began to liquefy, dissolving in the moonlight. Darby turned toward the hallway. Getting her feet to move demanded more of her will than slaying the monster from beneath the floorboards. She shuffled forward, her soles kicking up the faint, foul smell of spoiled fruit. At the threshold, Darby found her rosary beads and picked them out of the slurry. Then, her head held high, her eyes aimed straight ahead, she walked out of the ward and through the darkness. They were eating a meager supper. Neat rows of children with rigid backs and napkins spread over their laps, guarded over by Sisters of Mercy who showed little in the way of compassion, even as the storm resumed and life limped closer toward its final gasp of breath. “Where have you been?” one of the least-merciful barked, and reached toward the dirty little girl with the deranged expression. Darby ducked out of the Sister’s grasp and hurried to the table where Rona and the other mean girls sat, drinking in the action. “Well, well, Princess, I see you escaped from your tower,” Rona said, a mean little smirk on her lips. Without hesitation or fear, Darby marched right up to her and pushed Rona’s face into the food on her plate, the victory worth all she would be forced to suffer in the fallout that followed, in the face of the storm about to drown the world. 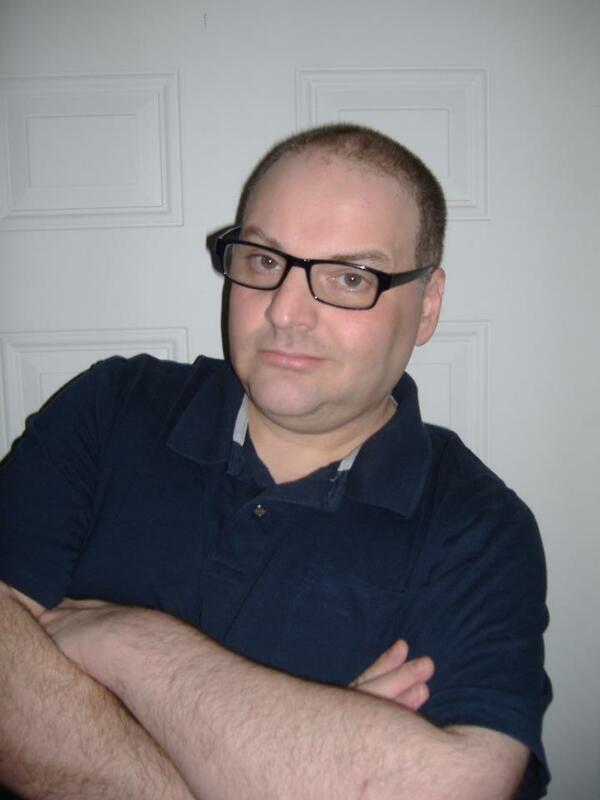 Gregory L. Norris is a professional writer with work published in a variety of places. He once worked as a screenwriter on two episodes of Paramount’s modern classic, Star Trek: Voyager, and is a former feature writer and columnist at Sci Fi, the official magazine of the Sci Fi Channel (before all those ridiculous Ys invaded). He is the author of the handbook of all-things-Sunnydale, The Q Guide to Buffy the Vampire Slayer, and two recent short story collections — The Fierce and Unforgiving Muse: Twenty-Six Tales from the Terrifying Mind of Gregory L. Norris, and Shrunken Heads: Twenty Tiny Tales of Mystery and Terror. Short stories of his have recently appeared in the anthologies Wicked Seasons, Dark Muses (also featuring reprints by Polidori, Washington Irving, Lovecraft, and Poe), and Canopic Jars: Tales of Mummies and Mummification, which he also edited for the fine folks at Great Old Ones Publishing. Norris judged the 2013 Lambda Awards in the Science Fiction/Fantasy/Horror category, and wrote the screenplay for the feature film Brutal Colors (Royal Blue Pictures). His next book, Tales From the Robot Graveyard is due out in Late 2014. Visit him on Facebook and at www.gregorylnorris.blogspot.com. If you enjoyed this story, let Gregory know know by commenting — and please use the Facebook, Twitter, and Google Plus buttons below to spread the word. Story illustration by Nikos Alteri. A fine ending to a fine story. I really liked it. 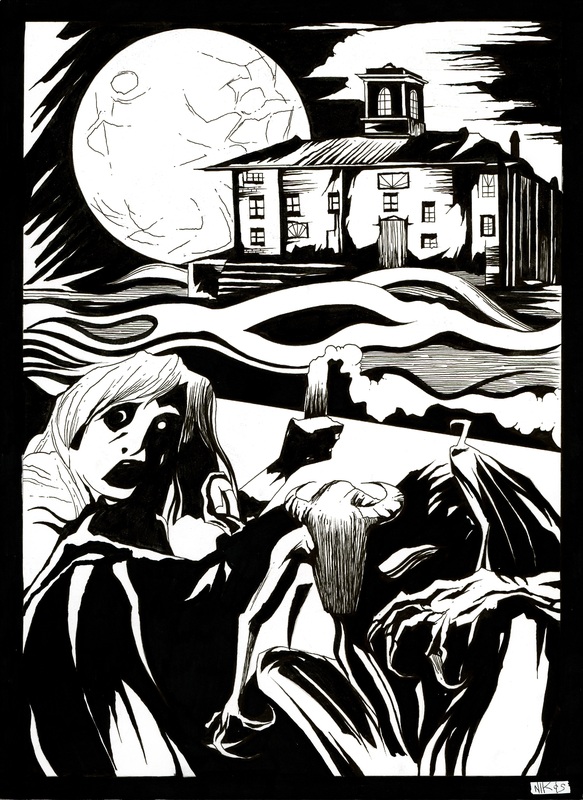 Greg: The best story I read so far, in issue 32 of the Lovecraft eZine. Arkham yes, but not a stereotypical Arkham, retold again and again in Lovecraftian pastiche. A small story, telling of small victories…but it ventured into the darkness in delicious and delusional ways. John, Jerriann, Destiny, and Kim — thank you all so much for your wonderful feedback on “Princess”! I would have responded sooner but just got home from a long weekend writing retreat in a rural house without any phone or internet coverage. While there, I drafted, among others, a new Lovecraftian tale. Hope to not disappoint when it’s published! Great story, Greg. Loved Darby’s new found courage in the end. Bullies don’t have anything on a queen bee! HA! Mark, thanks kindly for your comments — I am so happy Lovecraft e-zine readers approve! That was an amazing story and it was wonderful to finally read a Lovecraftian story with a strong female character who was capable of defending herself. What an enlightening comment, Ms. Sarah — thanks so much! A really enjoyable and engaging story. And I loved that ending! Thanks, Mark! I’m humbled and thrilled by your feedback! It was nice to read a well put-together Lovecraftian story that had a well earned triumph, however hollow that triumph may be in the drowing, dying world. The only thing I would have liked to see more of would be more detail on the symbols scratched into the floor and the monstrous bee itself.